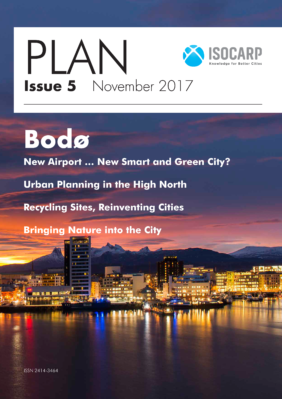 ISOCARP is proud to present PLAN 5 Magazine about the “New Airport – Smart Bodø” initiative. PLAN 5 Magazine contains articles and interviews that reflect the observations, insights and findings of the joint HPF and ISOCARP Urban Planning Advisory Team (UPAT) that visited the vibrant and ambitious City of Bodø in arctic Norway, during mid-summer 2017. PLAN 5 about the Bodø UPAT is published and made available on the ISOCARP website. The city of Bodø is the administration centre of the Nordland County in Norway. It has some 50.000 inhabitants, and it is situated beyond the Arctic Circle, some 1.200 km (by car or train) from the Norway’s capital Oslo. Functionally, Bodø is also part of the region informally known as Salten. Historically seen, it has strong relationships with other Far North communities in Sweden, Finland and Russia. Currently, Bodø is experiencing growth in population and it is transforming into a larger, modern Norwegian and in particular, Arctic city. In 2014, the City Council adopted the overall strategic plan named “Bodø 2030”. The vision presented in the plan is for Bodø to become an attractive capital in the North by 2030. The strategic plan contains six different focus areas including “sustainable city development”. Achieving climatic goals is at the essence of Bodø’s future sustainable development. The city aims to be an innovative low emission city, where the citizens feel safe from nature-related dangers. Reducing climate-damaging gas emissions and climate change adaptation are the main policy directions for future development. The opportunity to go further into sustainable development came in the same year, 2014. The airport of Bodø, which is at the same time a civilian and a military airport, is to be replaced. Military air activity will end in the next 7 – 10 years. In this decision of the Norwegian government, Bodø saw the opportunity to build the new city extension, near the city centre, with the ambition to become world’s smartest city. Bodø Municipality engaged Habitat Professionals Forum (HPF) and ISOCARP to assemble an international Urban Planning Advisory Team (UPAT) made of planning professionals from 8 countries. The task of the team was to 1) provide an assessment of the Smart Bodø strategic plan, 2) evaluate how the existing city can best connect and integrate with new areas of development 3) write recommendations for future use and land management 4) carry out comparative research between best smart practices in cities around the world. The first phase (2015 – 2025) primarily focuses on initiating the compact redevelopment of the inner-city harbour area and on the shifting the airport further to the south. The second phase (2025-2035) completes the projects initiated in the first phase and firmly anchors the Sea-Air-Rail logistics hub around the West Harbour, behind new airport terminal. The third phase (2035-2050) focuses on efficient utilization of the airport site establishing of a series of high-intensity mixed used growth nodes. The backbone of the compact redevelopment of the inner city harbour area and the high-intensity mixed used growth is a well planned and designed public space. Designing public space in a Smart Arctic City is a special challenge, considering natural wonders at one side (the northern lights and the midnight sun) as well as natural threats such as extreme temperatures and wind conditions. But it also opens a whole new range of possibilities not so easily found elsewhere, such as integration of abundant water resources, re-use of parking lots or shared streets concepts.